For those of us schooled through the Advanved Life Support courses I think we may be forgiven for thinking of Ventricular Fibrillation as a single condition. 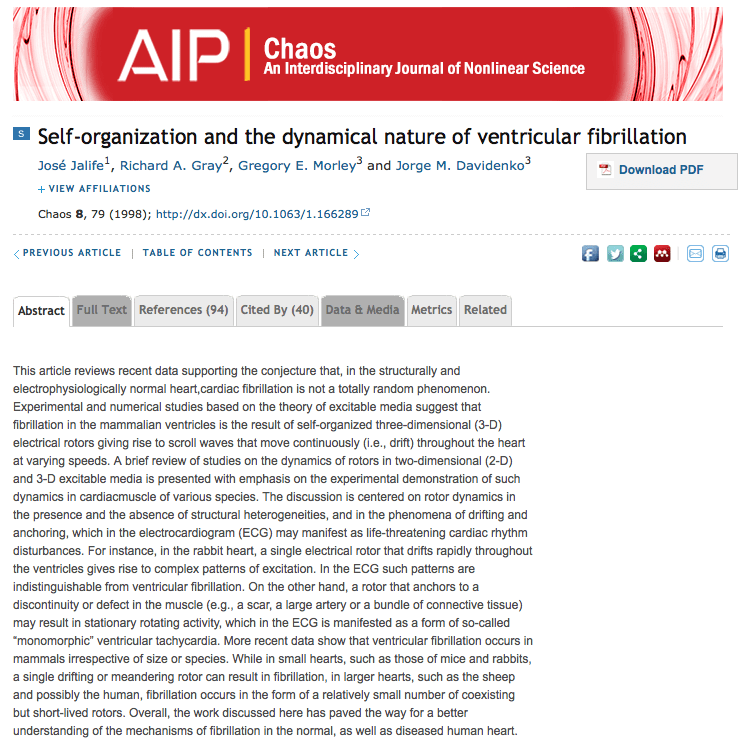 The treatment of VF follows a set algorithm that certainly implies that we are dealing with a single condition, one which I was taught to be random and unorganised. This may not be the case with papers describing the potential for organisation and a degree of order within order in VF models. You should really read the paper in the Journal ‘Chaos’ which I sort of feel could be an EM journal (from the title at least). 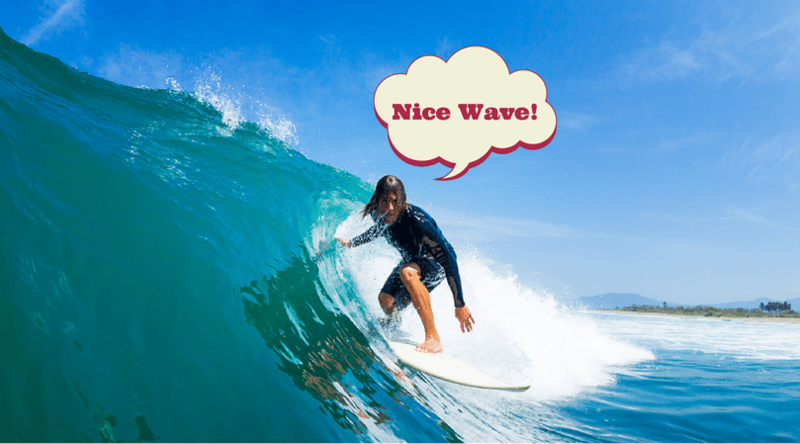 There is also evidence from a number of papers to suggest that wave form analysis can be predictive of successful defibrillation. Lin in 2010 demonstrated this in an observational study of 155 patients in Taiwan, though the clinical utility of this was uncertain. Clearly an RCT would be required to answer this problem so I was pleased to revisit this paper from Circulation last year. The abstract is below, but as ever read the full paper if you have access. This randomised controlled trial used AEDs to randomise patients in VF into two treatment protocols. Patients were randomised to either standard protocols, which would include immediate defibrillation for VF arrest or to the intervention group. In the intervention group the AED performed a VF waveform analysis. If that analysis indicated immediate defib then it was performed, if not further CPR took place for two minutes before reanalysis. The AED uses an algorithm that indicates defibrillation when the likelihood of success is greater than 80%. The study was conducted in the prehospital setting in London and New York. Of 6738 patients in cardiac arrest, 1124 were in VF arrest. A further 137 were excluded on age, aetiology, DNAR or incomplete AED analysis reasons. This left 987 patients for randomisation. Groups were similar at baseline with an average age in the mid 60s. Of the 487 patients randomised to waveform analysis 225 had a VF score below the threshold for immediate defibrillation. That’s important as it is in this group that we are most likely to see difference in outcome (as that’s really our subgroup who receive the new intervention). As with all studies in resuscitation there appears to be many proxy outcomes and sub-analyses looking for trends and subtlety. That’s fine but we should focus on the principle outcomes which in this case is survival to hospital, and then survival to hospital discharge. In these respects the outcomes were disappointing to fans of waveform analysis. A further analysis in the sub group of patients with VF less than the algorithm threshold (so those patients in whom no immediate shock indicated) similarly showed no difference but with worse outcomes in all areas. Despite the theoretical advantages to reserving defibrillation to those patients in whom it is most likely to succeed this trial suggests that there is no benefit. However, there are a number of caveats that we should think about. The algorithm was based on an 80% success rate for defibrillation and this may be too low or too high to demonstrate benefit. Post arrest care was not standardised although randomisation should reduce this potential bias. Intermittent analysis may miss a period of optimal defibrillation with others suggesting that continuous monitoring during CPR may have potential. The authors make a case that it may be the quality of CPR that affected success. Whilst CPR quality may have an effect in optimising patients for defibrillation this variable should be balanced through the use of an RCT method so I am not convinced on the evidence presented. So it seems that this technology is not as yet ready for prime time, though I think it’s only a matter of time until someone tries an RCT combining mechanical CPR with an integrated VF analysis defibrillator. Waveform analysis-guided treatment versus a standard shock-first protocol for the treatment of out-of-hospital cardiac arrest presenting in ventricular fibrillation: results of an international randomized, controlled trial. Influence of cardiopulmonary resuscitation prior to defibrillation in patients with out-of-hospital ventricular fibrillation. Detrended fluctuation analysis predicts successful defibrillation for out-of-hospital ventricular fibrillation cardiac arrest. Ristagno G, Li Y,Fumagalli F,Finzi A,Quan W Amplitude spectrum area to guide resuscitation: a retrospective analysis during out-of-hospital cardiopulmonary resuscitation in 609 patients with ventricular fibrillation cardiac arrest. Resuscitation. 2013;84:1697–1703. Correspondence on this paper at Circulation site.